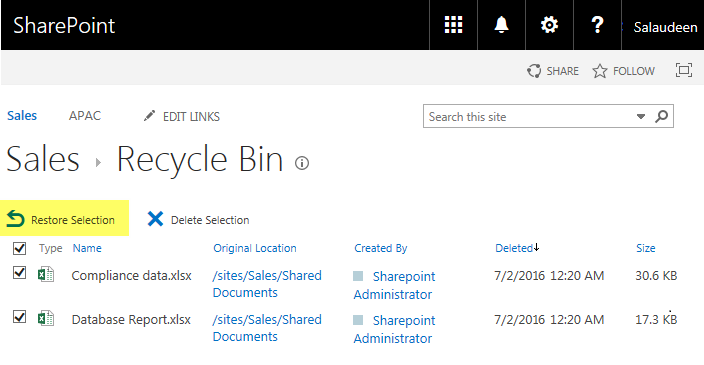 Task: Recover a deleted document from the recycle bin in SharePoint online. How to Restore from Recycle Bin in SharePoint Online? Login to your SharePoint online site and click "Site Contents" from either site settings gear or from left navigation. Click on "Recycle bin" link from the top of the page. Select the document(s) you would like to restore and then click "Restore Selection". Confirm restore by clicking "OK" button. The files you selected is available in the original location from where it was deleted. 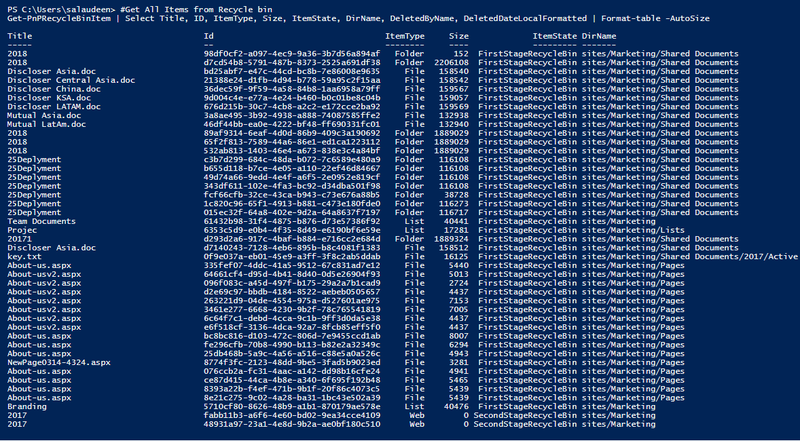 Now, Lets see the SharePoint Online PowerShell to restore items from recycle bin. Let's use PowerShell to restore all excel files from recycle bin. $Password = Read-host -assecurestring "Enter Password for $UserName"
Please note that the above script restores from 1st stage recycle bin (or end-user recycle bin). Instead of Web object, you may have to use Site object if you want to restore from Site collection Recycle bin (Or 2nd stage recycle bin). This gets you all items in recycle bin with their IDs. A colleague managed to delete a whole departments files (60,000 in 7700 folders) from Sharepoint Online - manually restoring them with the GUI has proved to nearly impossible (many timeout errors) so I stumbled upon your page in searching for a PowerShell solution. I'm a novice at PowerShell but it must surely be possible to restore all items in the recycle bin or even better all items in the recycle bin deleted by a specific user? Are you able to help with this? Sure, Just removed the "Where" class in Line#26 and run the script in PowerShell ISE! How can you restore files deleted by a particular user within a specific time? That is exactly the same question I'd like to ask. I do not get the script to work properly at all.